My friend Asim at Swallowtail Farm hooked me up with a pair of lovely winter squash last week. According to Asim, these are "kobocha" pumpkins, which are a type of Cucurbita maxima. In case you don't know your squash varieties in Latin, there are 4 main edible species of squash that have been developed into a baffling array of cultivars. They are C. maxima, C. mixta (also known as C. argyrosperma), C. moschata and C. pepo. The best varieties for the heat and humidity of the south are C. moschata types. Those include a lot of tropical pumpkins, butternut squash and Seminole pumpkins. 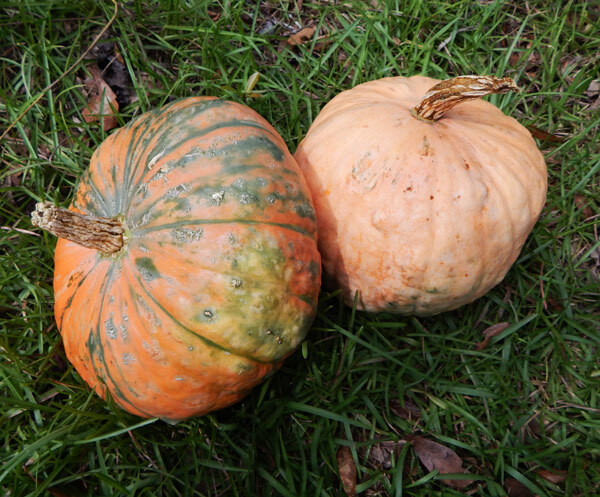 These kobocha pumpkins had a mild, nutty flavor that wasn't as rich as my Seminole pumpkins. I saved the seeds and will be growing some next year, however, since they won't cross with my other types and because they look cool. My tropical pumpkin/squash breeding experiment is all comprised of C. moschata types, which means I can grow C. pepo or C. maximas in the same beds without worrying about undesirable cross-pollination. I don't know what it is, but I really, really like growing squashes. I think it's because of their incredible beauty. If you want to grow winter squash in Florida or the southeast, the easiest types to start with are Seminole pumpkins, cheese types, or any variety of butternuts. Also, if you're interested in squash as a survival crop, you should REALLY pick up a copy of Carol Deppe's book The Resilient Gardener. I haven't tried eating pumpkin leaves yet. Great idea. I also haven't tried Marsh Mallow. Upper Ground Sweet Potato squash is in the same species as Seminole pumpkin, meaning they'll cross pollinate. Save seeds this year and plant again next year... bet you get something good. definitely going to hope for some cross pollination and save seed.. I love your/the idea of the toss and cross creations.. I think it would be great for every small homestead to have their own family pumpkin to share. When those Seminole pumpkins "catch", they produce SO MUCH FOOD. I planted mine a couple-three weeks too late this year so the plants have struggled against squash vine borer since the beginning. also. for the record. 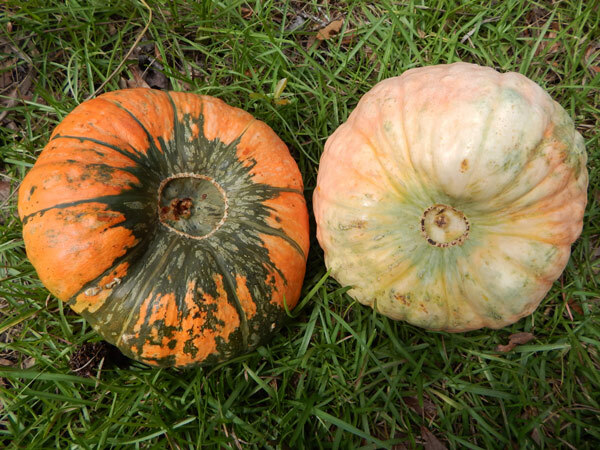 I know they're the same species.. and I got them just because it was funny how much they are described alike and look exactly the same.. that was my BAD attempt at a joke referencing your post on the incredibly diverse nature of what a Seminole Pumpkin is.. I'm not as dumb as I sound.. but am always grossly earnest. my vines are JUST now blooming I don't know if it's in a timely manner but I'm excited. I'm in love with this plant. Yes - they do look a LOT alike. Grossly earnest is a good thing. I hope they do great for both of you. There's still plenty of season left. Love the video! I wish I had more room to grow more squash and pumpkins! It's my favorite thing to grow.